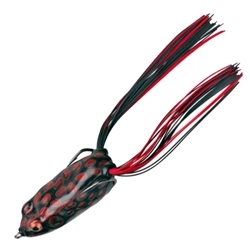 The Booyah Pad Crasher hollow-body frog features an internal weighting system and "bass boat" belly that prompts it to walk side-to-side easier than other frogs. This frog also has the drain hole at the back that ensures it always runs perfectly. This 1/2oz Pad Crasher is string enough to handle the violent bass bites, but light enough to not get tangled in weeds.